In planning for nearly three years the pitch contract was awarded to Wills Bros a well known and respected contractor who have a great deal of experience in large scale contracts. With poor ground conditions and a large earthworks contract to deal with the works have been tackled in a very quick fashion. Assisted by the weather 1000's of cm of soils have been moved and placed to an exacting specification all monitored by quality control tests through out the placement and compaction of the fill. Now the site has been stabilised and capped the drainage has commenced this week possibly just in time for the weather to break! Fantastic progress in just 6 weeks. Current progress can be seen from the photos attached where the cap of crushed stone can be noted here. 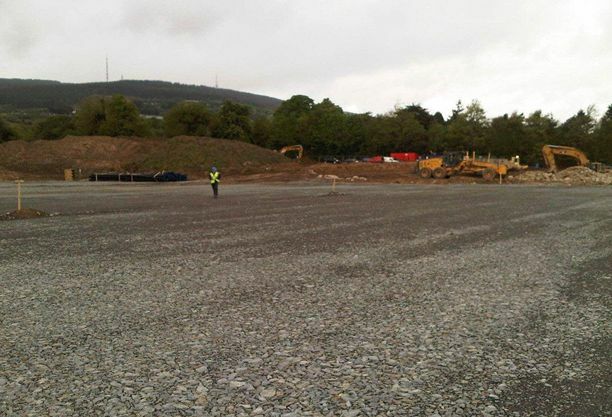 The pitch will eventually host a high performance 3G surface which can be used for Gaelic games, rugby and soccer. The facility is an asset in the area where there are currently no full size GAA 3G surfaces in the Council District. Further updates will be posted during the construction phase. Watch out for the montage of progress from start to finish. Eoin Sports Labs have been assisting the Council on a a variety of sites with specifciations, tender evaluation, quality control and testing and expert advice.